We live simply | Sprezzatura, Y'all! 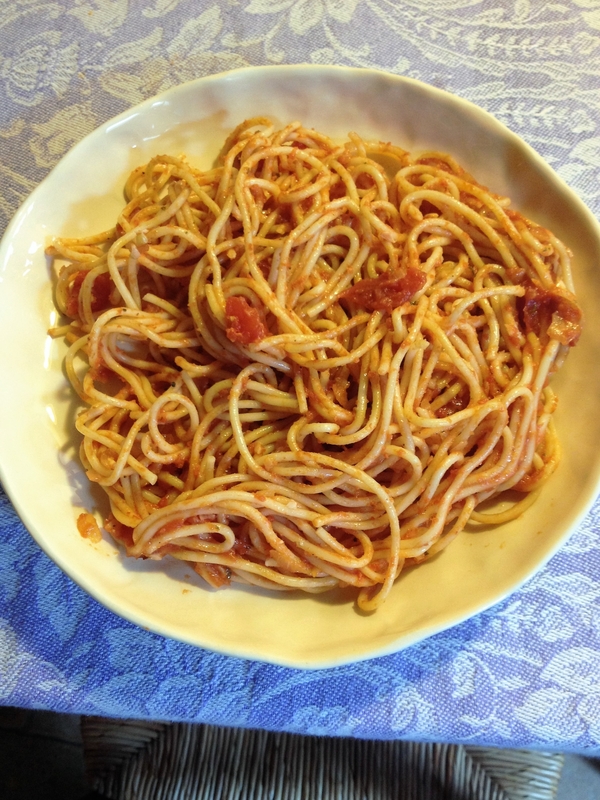 After our extravagant trip to Switzerland, we are trying to be frugal and simple this week. Our dear friend Myra is coming next week, so we want to be in top form for that as well. This week has been the perfect time to do this for two reasons: 1) It’s been raining and chilly all week, and 2) our car is in the shop (long story). At first, the prospect of not having a car sent us into a panic. How will we get what we need? What if we have an emergency? Our American instincts kicked in and we thought that we would have to get a rental. Then we slowly realized that we have everything we need within walking distance here and for a week, no car is really no big deal. 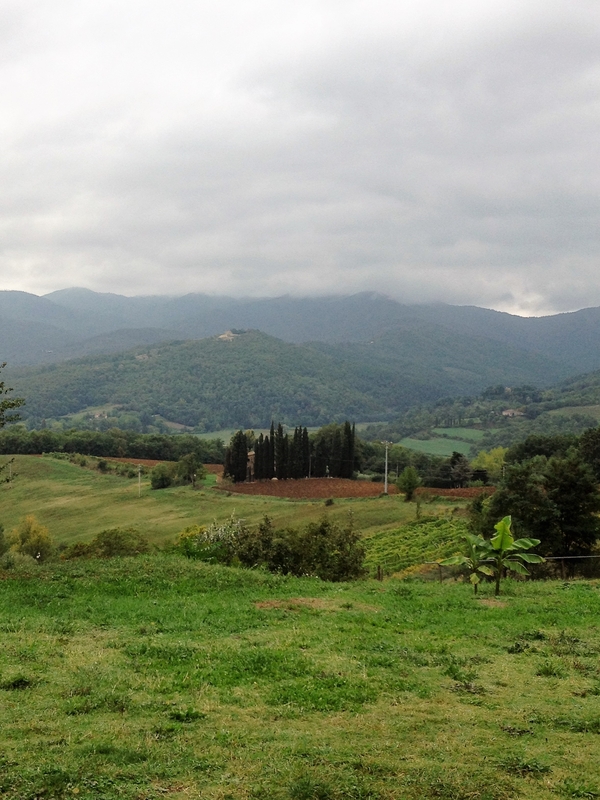 We became tranquillo (tranquil – a favorite word of Italians) about the whole thing. All the food we could want – fresh produce, fruits, meats, bread, pastries, cookies – all within seconds of our front door. If we wanted to go to a restaurant, dozens, again within seconds of our door. Household provisions – a little further walk, but still perfectly doable. We got back from Switzerland late Saturday evening, and Sunday was a beautiful day. There was an antiques market in town and we strolled through that several times on our walks. 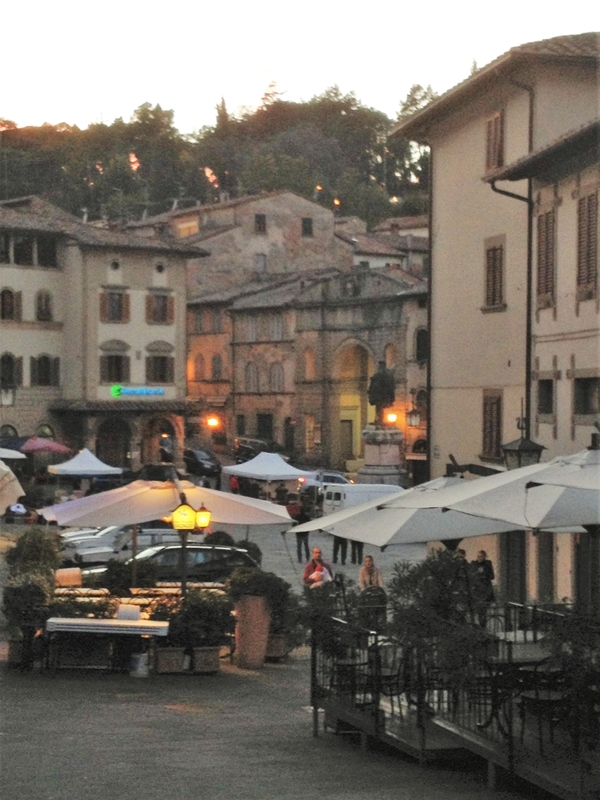 We just enjoyed being back in Italy, seeing our neighbors, the shopkeepers, running into friends. We had just been gone a few days, but it seemed longer and we relished being back. We had a long Sunday lunch at the restaurant downstairs, two courses each, wine and dessert for 30 euro. Delicious! So, while we’ve been cocooned, we get up every morning and decide on food for the day. We’re savvy Italians now and we know that we have to plan for what we are going to cook and go buy it before the siesta. We plan for the day, and maybe look ahead to the next day if we know we want something slow cooked. Monday was still a nice day, but we knew rain was coming in a big way, so we went to the butcher (macelleria) and got a pork roast for dinner, some proscuitto slices for lunch, and some chicken pieces for stock. For lunch we made panini with tomatoes, proscuitto and mozzarella. That afternoon I made the chicken stock, just in case. I don’t know if it’s real or imagined, but it was the best chicken stock I’ve ever made. Rich and golden with just enough body so that it jiggled ever so slightly and a flavor that made you smile. 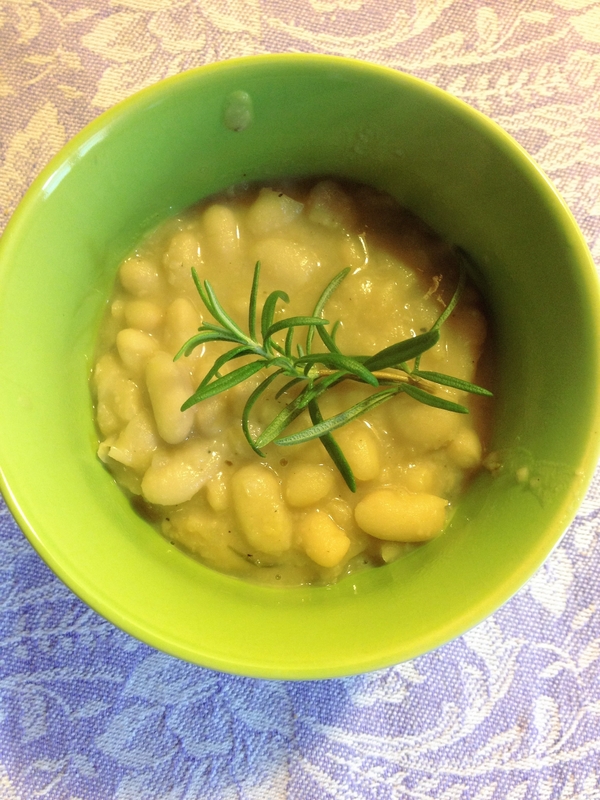 Then it came to me – slow cooked white beans in broth. That’s what I would make for the rainy day ahead. Something warm and nourishing. And rain it did. Periods of downpours, some misty sprinkles, a few dry periods where we would run out just to get outside (and get gelato). Millie fell back into her old Atlanta routine of sleeping 20 hours a day. So it was the perfect day for a pot of slow cooked Tuscan beans. We got the dried beans from one of the produce stores in town, a nice hunk of crusty, Tuscan bread from the bakery, and I have been saving pieces of proscuitto for just this occasion. I threw in the heel of a parmesean wedge for seasoning a sprig of rosemary from our kitchen window box and let it simmer for a couple of hours. The house smelled divine as the rain ran down the streets and we could hardly wait until dinner to dish it up. It was perfect. The weather was no better the next day. It seemed like the rain had taken over the valley and was here to stay. During the few breaks in the rain we would run out and walk Millie, take a tour through town, and just get out and stretch our legs. And, of course, go to the markets for our dinner. Dinner the next night would be a very simple pasta with tomato sauce. This is a dish that I’ve made hundreds of time back in Atlanta – it’s what we have when we don’t have anything else or don’t have time to pull anything else together. Making it here was the same, but somehow the result was different. Again, not sure if it’s my imagination, but it was different. Not necessarily better, just different. It had a creaminess to it that made it more satisfying, not as light as it is in Atlanta. It was, again, the perfect meal for a rainy night. A little green salad on the side and some Swiss chocolate for dessert. Well, I had to bring something back from Switzerland, right? After dinner the rain stopped and the fog came. We took a walk and couldn’t believe how thick the fog was. You really couldn’t see anything. Looking over the city walls was like peering into a smoking cauldron. The street lights were obscured by the fog and cast only the suggestion of a hazy light. Walking through this medieval village in the dense fog was pure Hollywood. We felt like we were in a haunting, gothic movie and should be wearing black cloaks and saying things like “Beware”. The fog gave way to pure sunshine the next day and we all took a very long walk. It was wonderful to be out and see the blue sky. 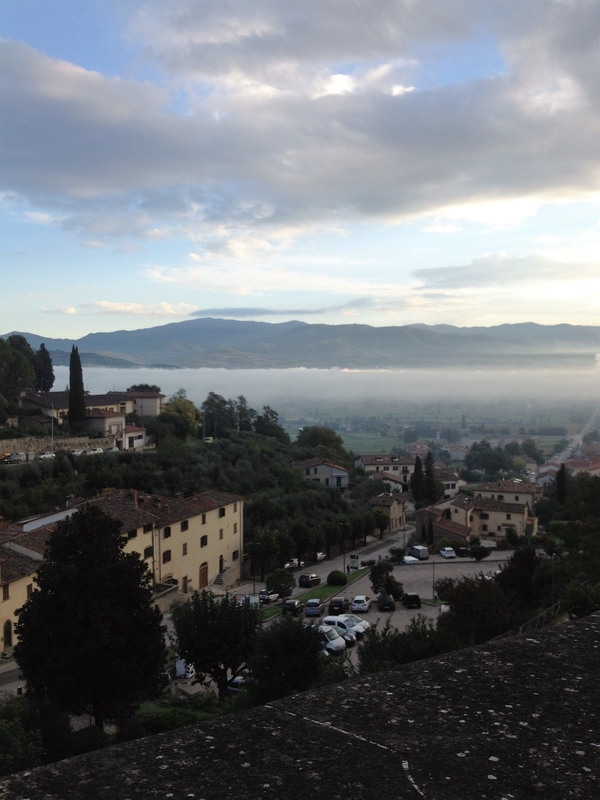 We made a few stops, caffe with Michelangelo, to the produce market for salad ingredients, and made our way home. A little more work around the house, many more walks around town, some naps, some work, and then to dinner prep. 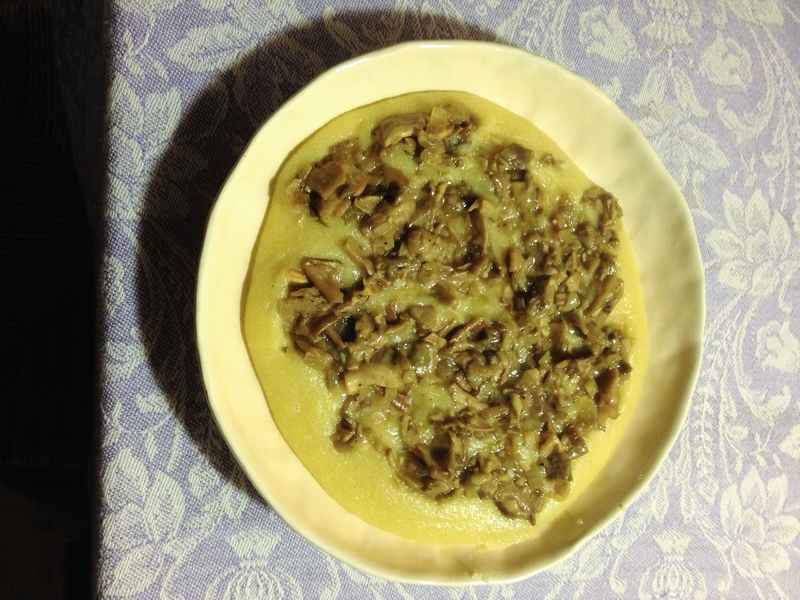 That night we had polenta with porcini mushrooms. Again, very simple, but very wonderful. I don’t make polenta that often in Atlanta, so I need directions for quantities. Reading the directions on the package was a family affair because it involved translating and guessing and bridging between what the actual translation was and what the intent was. We got through it and poured the fine polenta into the boiling water and watched it thicken up and become something wonderful. There is an art to making perfect polenta and I don’t have it. I did make it one time with Rosella, Michelangelo’s wife, and she clued me in to a few tricks, but I still have a long way to go to become a pro. Despite this, it was pretty darn good. She did teach me to pour the leftover polenta into a pan immediately or else it would harden. Then you slice it and have it for breakfast or lunch the next day. So we had the creamy polenta with the porcini mushroom sauce for dinner and heated up the cakes for breakfast. I love it when your next meal is already made for you. Our week of living simply ends tomorrow when we get the car back. We have places to go and things to get and festivals to attend. But the week was special in that we enjoyed each other, Millie got lots of naps, and we appreciated the town in a different way. And we made lots of meals in our little kitchen. Every night while we had dinner we would play music and always included Pavarotti’s version of Nessun Dorma. We decided that we would play that at least once a day while we’re here. And maybe when we get back, too. You should try it. Your week of living simply sounds wonderful and thanks for sharing the beautiful music!!! Soon you will be experiencing wonderfulness, too! Although it won’t be simple at all – we will be living large! Love all this sooooo much! You are living large, my friend, while simply. How truly wonderful! Thanks, Vee. I love the perspective I’ve gained since being here. Hope I keep it forever. Oh yes, the Pavarotti rendition is perfect. A little piece of Italy for everyone! Enjoy!! Your blog is delightful!I live reading every word! Thanks, Karen. I’m so glad you’re enjoying it. It’s so much fun for me to do this. Technology is wonderful!